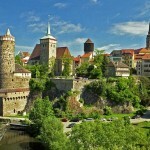 Aschaffenburg is a city in northwest Bavaria, Germany. 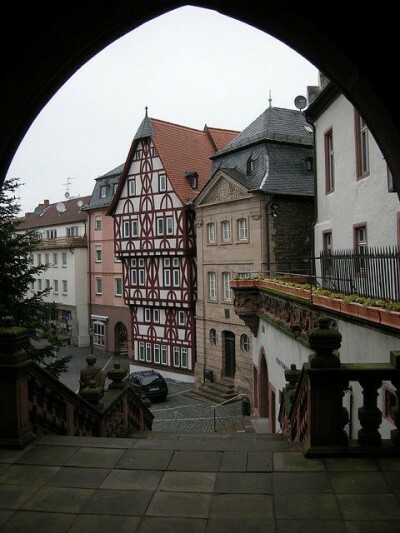 The town of Aschaffenburg is not considered part of the district of Aschaffenburg, but is the administrative seat. 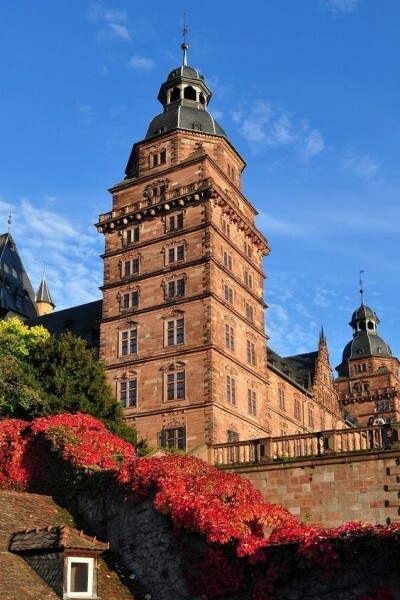 Aschaffenburg belonged to the Archbishopric of Mainz for more than 800 years. 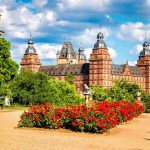 The city is located at the westernmost border of Lower Franconia and separated from the central and eastern part of the administrative district by the Spessart hills, whereas it opens towards the Rhine-Main plain in the west and north-west. 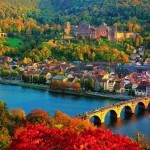 Therefore, the inhabitants speak neither Bavarian nor East Franconian but rather a local version of Rhine Franconian. 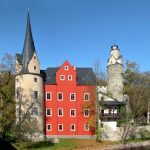 The town is located on both sides of the River Main in the southwest part of Germany, 41 kilometers (25 mi) southeast of Frankfurt am Main. 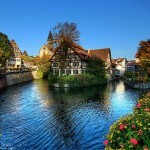 The second river is the small Aschaff which flows into the River Main in the western part of the city. 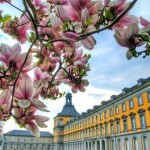 The region is called Bayerischer Untermain or Bavarian Lower Main. 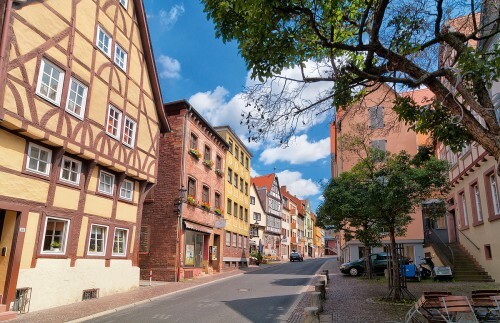 The name Aschaffenburg (Ascaffaburc, Ascapha or Ascaphaburg in the Middle Ages) originally meant “castle at the ash tree river” deriving from the river Aschaff that runs through parts of the town. The town suffered greatly during the Thirty Years’ War, being held in turn by the various belligerents. And then again during the Battle of Dettingen, the town was occupied by French troops. 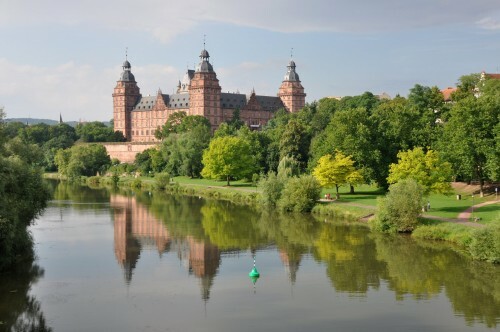 It formed part of the electorate of the Archbishop of Mainz, and in 1803 was made over to Archbishop Karl Theodor von Dalberg as the Principality of Aschaffenburg. 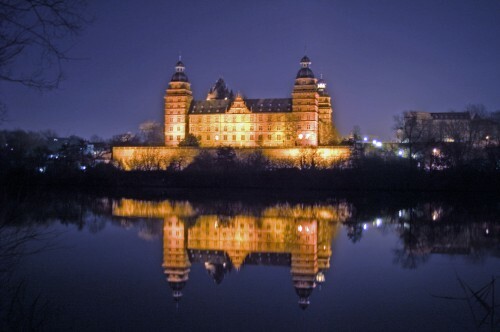 In World War II, Aschaffenburg was heavily damaged by Allied area bombing, including Schloss Johannisburg which was completely restored several years later. 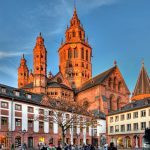 It was erected between 1605 and 1614 by the architect Georg Ridinger for Johann Schweikhard von Kronberg, Prince Bishop of Mainz. 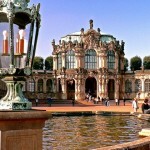 Until 1803, it was the second residence of the Prince Bishop of Mainz. 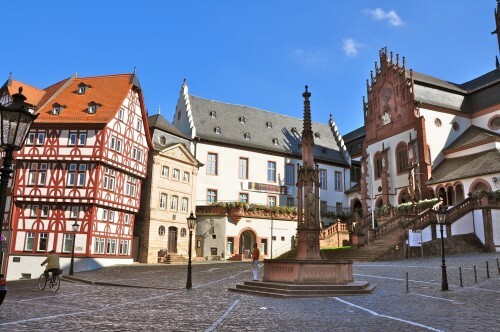 It is constructed of red sandstone, the typical building material of the Spessart, the hills near Aschaffenburg. 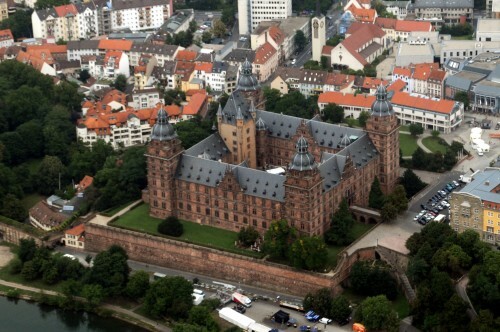 Aschaffenburg was the location of several United States Army installations throughout the Cold War. After initially taking over the administration of the ex-Wehrmacht installations, which were then used as displaced persons camps, the American presence in the Aschaffenburg military community began after general renovations in 1948. The installation sites were known as Ready Kaserne (previously Artillerie Kaserne), Smith Kaserne (previously LaGarde Kaserne), Graves Kaserne (previously Bois Brulé Kaserne), Fiori Kaserne (previously Pionier Kaserne), and Jaeger Kaserne (previously Jäger Kaserne). These housed armour, infantry, engineer, maintenance and artillery elements of the US Army 3rd Brigade, 3rd Infantry Division and various VII Corps elements including the 9th Engineer Battalion, the 3rd Bn 21st Field Artillery (Honest John), and the 1st Bn 80th Field Artillery (LANCE). Much of the US Army presence in Aschaffenburg ended in 1992 with the ending of the Cold War. The last buildings, which were primarily used for housing, were handed back to the local government in 2007.